Drive Medical Quick 'n Easy Comfort Mattress from HealthyKin.com is a premium quality homecare foam mattress offering the utmost in comfort. The patent pending super compression technology packages the mattress in a box with a footprint of just 14" x 14" x 37 5". The mattress core is made from a select grade of polyurethane foam that offers the comfort, feel and advantages of latex rubber without the latex allergen. 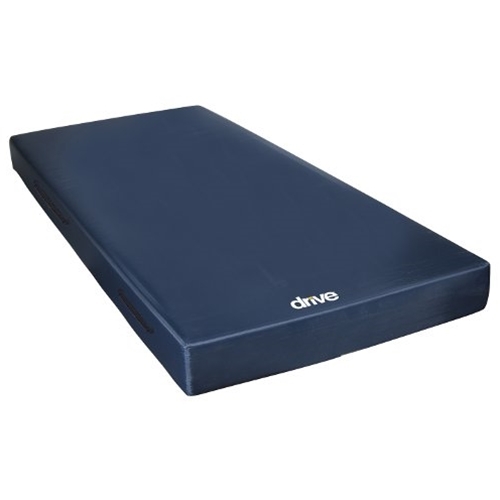 The non-slip bottom and 4 corner straps keep the mattress securely in place. Two carry handles on the side make lifting and placement easier. The durable nylon cover is fluid resistant for easy use and care.